Abstract: We construct and explore a new quarterly dataset covering crisis episodes in 40 developed countries over 1970–2010. First, we examine stylized facts of banking, debt, and currency crises. Banking turmoil was most frequent in developed economies. Using panel vector autoregression, we confirm that currency and debt crises are typically preceded by banking crises, but not vice versa. Banking crises are also the most costly in terms of the overall output loss, and output takes about six years to recover. Second, we try to identify early warning indicators of crises specific to developed economies, accounting for model uncertainty by means of Bayesian model averaging. Our results suggest that onsets of banking and currency crises tend to be preceded by booms in economic activity. In particular, we find that growth of domestic private credit, increasing FDI inflows, rising money market rates as well as increasing world GDP and inflation were common leading indicators of banking crises. Currency crisis onsets were typically preceded by rising money market rates, but also by worsening government balances and falling central bank reserves. Early warning indicators of debt crisis are difficult to uncover due to the low occurrence of such episodes in our dataset. 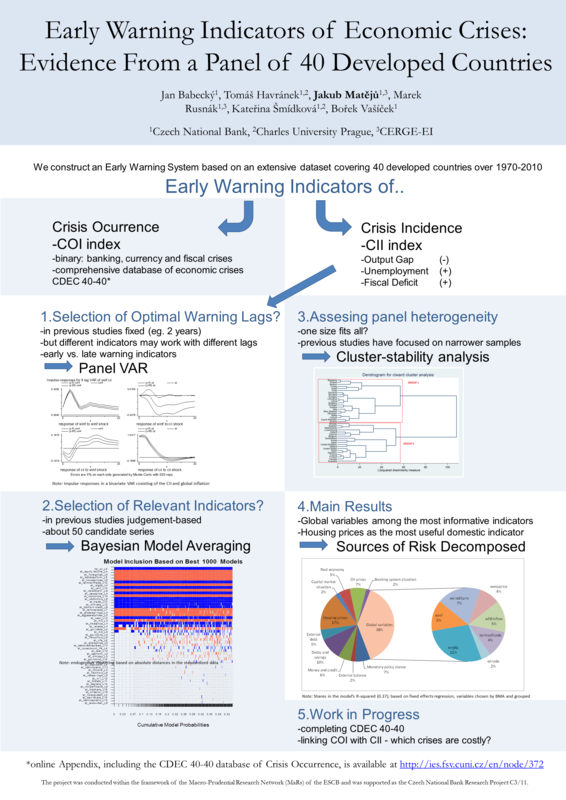 Finally, employing a signaling approach we show that using a composite early warning index significantly increases the usefulness of the model when compared to using the best single indicator (domestic private credit). The draft version of the paper is available here. The database of banking, debt and currency crises for 40 EU and OECD countries over the period 1970–2010 is available here. Additional results (BMA) are available here. An earlier version of the paper was presented at the Second Conference of the Macro-prudential Research (MaRs) network of the European System of Central Banks; see the presentation. Revise version published as: Jan Babecký, Tomáš Havránek, Jakub Matějů, Marek Rusnák, Kateřina Šmídková, and Bořek Vašíček (2014): Banking, debt, and currency crises in developed countries: Stylized facts and early warning indicators. Journal of Financial Stability 15, 1-17. Abstract: We search for early warning indicators that could indicate important risks in developed economies. We therefore examine which indicators are most useful in explaining costly macroeconomic developments following the occurrence of economic crises in EU and OECD countries between 1970 and 2010. To define our dependent variable, we bring together a (continuous) measure of crisis incidence, which combines the output and employment loss and the fiscal deficit into an index of real costs, with a (discrete) database of crisis occurrence. In contrast to recent studies, we explicitly take into account model uncertainty in two steps. First, for each potential leading indicator, we select the relevant prediction horizon by using panel vector autoregression. Second, we identify the most useful leading indicators with Bayesian model averaging. Our results suggest that domestic housing prices, share prices, and credit growth, and some global variables, such as private credit, are risk factors worth monitoring in developed economies. The figures of the real costs of crises for 36 EU and OECD countries are available here. Additional results (PVAR) are available here. Revised version published as: Jan Babecký, Tomáš Havránek, Jakub Matějů, Marek Rusnák, Kateřina Šmídková, and Bořek Vašíček (2013): Leading Indicators of Crisis Incidence: Evidence from Developed Countries. Journal of International Money and Finance, 35(1), 1-19. This is an earlier version of both discrete and continuous models. The draft version of the paper is available here. The (preliminary) Comprehensive Database of Economic Crisis for 40 EU and OECD countries over the period 1970-2010 (CDEC 40-40) is available here. Additional results for all 40 countries are available here. An earlier version of the paper was presented at the First Conference of the Macro-prudential Research (MaRs) network of the European System of Central Banks; see the presentation.